Coyotes roam the Northern California landscape as naturally as the curving arms of oak trees and shimmering light of golden grasses. Animals are the environment, the land is our home, and no matter where I rest my head, I dream of this homeland. Its skin, scattered with abandoned Quonset huts, fading into fields with salted, rusting farm equipment baring aquamarine metallic undersides from fog long come and gone. Pines and redwoods sighing through picnics and lovers’ quarrels, soaring bi-planes overhead rising and falling like the Cooper’s hawks who cross the valley floor, searching among the mustard meadows as the earthy smells of dairy pastures carry the work of day into dusk, and the awakening of streetlights flicker among the song of the crickets. Night falls and a coyote cries. What relief to unburden oneself from human society. You wake up, alone but in a new place. You figure it out, alone. You survive by yourself. You thrive with yourself. Creativity must be alone, because of alone. Traveling alone far surpasses traveling with human companions, most of the time. Those spiritual journeys, when our senses are most alive, when the silences of solitude allow our hearts to feel what we hide in dialogue, those adventures are the most memorable and the most wild within. And yet we are not alone. The nonhuman world is always there, and that is why freedom means coexisting. Her work friend is a big, loafing red-haired Burmese Mountain/Lab mix who obeys the laws of nothing. He sleeps most of the day, whereas Posy will run all day long. But they love each other. Posy has scraped the paint off the door to his office, trying to get in. If he could barrel through it to get to her, he would. We call them buddy cops, these oddly-matched friends. Posy is the energetic, naïve new graduate of the academy, ready to clean up the streets; Chester, the aging, cynical, lazier cop, loathe to make an effort after all these years. But together, he calms her and she ignites him, and they run in our parking lot and along the creek bed, as if the bad guys are getting away. Last week, a suburban coyote sparked the apex of their buddy-cop drama. Chester went into the creek after her, finding the coyote cousin and the stagnant water irresistibly appealing. She was perhaps the largest coyote I’ve ever seen, darting behind a fence on the side of the creek bed. 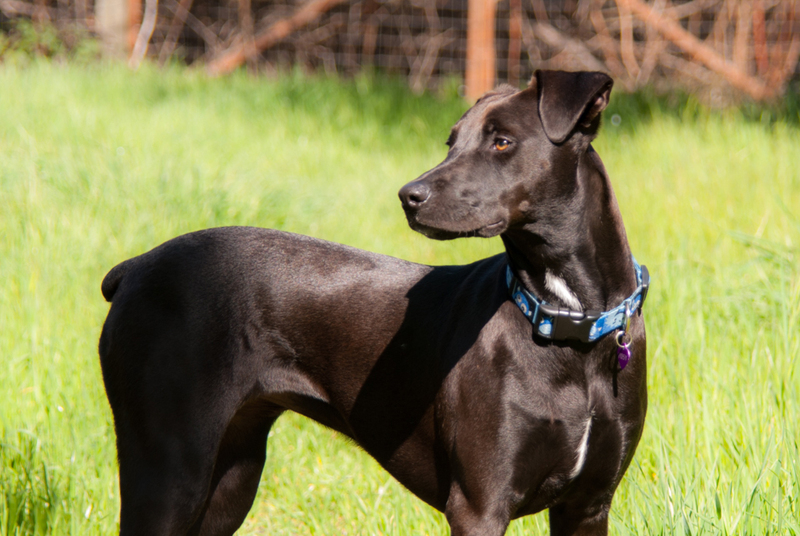 Having found herself fenced in, caged essentially by a house fence, and with a gigantic domesticated dog splashing toward her, she searched intensely for her getaway. Yet Posy stood by my side, neither alarmed nor intrigued. I was moved by her ability to stay distant, and just quite simply leave this wild animal alone. Coyotes deserve to be left alone. Our office is headquartered on a busy main street in a semi-rural town. Collisions are a weekly occurrence. In fact, it’s the same street on which my mother was run over by a delivery truck as she was crossing on foot. Yesterday, a wild turkey lay scattered on its asphalt, the victim of speeding driver. A short walk down the road from our office, one will encounter wild turkeys and ducks, ring neck snakes and foxes, and farmed goats, pigs, chickens, and cows, guard llamas, and domesticated dogs and cats, in addition to urban squirrels, feral cats, and various rodents. Whizzing along at this pace, people may see only cars and apartments and shops, but I see the other animals living among us, in our shadows. Amid suburban and semi-rural chaos, they are not shadows to themselves. Their world is just as important to them as ours is to us. How glorious it might have been for other animals, before humans encroached upon the sun. Unfortunately for wildlife, our countryside and wetlands are being drained for agriculture or developed for industry. What was once a mix of pools, lakes, marshes, woods, and plains is now tract houses, strip malls, vineyards, and urban sprawl; as a result, biodiversity is diminishing and species compete for smaller waterways. 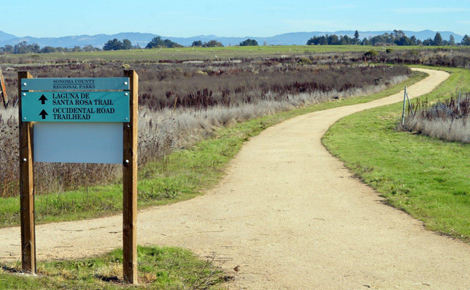 The Santa Rosa Laguna watershed, running northwest from Cotati and entering the Russian River north of Forestville, drawing in smaller watersheds, cleans the water headed toward the river, and provides runoff for floods and habitat for wildlife. Its recent restoration has included the re-planting of hundreds of native plants, grasses, sedges, and rushes. For a timespan hard to fathom, the Sonoma Valley was home to only nonhuman animals. Then, it was shared with Coastal Miwoks, in the village of Kota’ti. Next, like the rest of the U.S. in the early 19th century, it was industrialized for agrictulture—a fellow named John Thomas Reed built a cabin on Crane Creek and started farming, until the Kota’ti burned it down. At that time, the valley belonged to Mexico, which leased thousands of acres of “Rancho Cotate.” By mid-century, Mexico’s hold over the territory was displaced. Thomas Page, an absentee landlord, then held title to the valley and introduced sheep and cattle ranching to the area. When the train came to town, the railroad stopped at Page’s Station—a wood and water stop. Page ranch butted up against Washoe House (built in 1839, now a famous, though quirky watering hole), and subdivided land parcels as the Cotati Land Company. Echoing history, a light-rail super-speed train will once again connect San Francisco with the North Bay, via Cotati. Good for commuters and the overdeveloped wine industry. What will that mean for our already diminishing wild spaces? 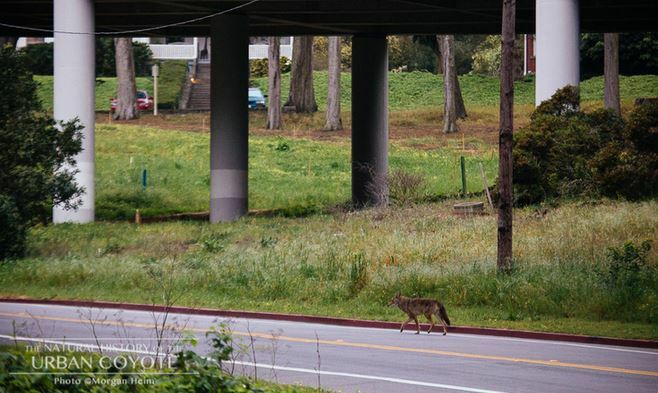 Cotati—like so many other places—celebrates coyotes. Businesses with “Coyote” in their name abound, because coyotes dance upon the landscape of our imaginations. But does that mythos allow us to usurp their land and overlook their needs, guilt-free? If only we could get out of their way. Legally, coyotes can be killed with few limits. Unprotected beyond cruelty statutes, they are “vermin” under the law. There are no “bag limits,” no hunting “seasons,” and for years, the abuse of legal loopholes has allowed groups to hold bloodbath killing sprees known as “killing contests,” which award large prizes for whoever slaughters the most, and the biggest, of our native songdogs. A few months ago, California became the first state to ban prizes for those killing contests. But that didn’t stop the contests. A few years ago, I was flying to a leading animal rights conference and reading a magazine by Defenders of Wildlife—a conservation group who supported the reintroduction of wolves by financially offsetting wolf depredation for ranchers. A woman next to me was reading about sheep ranching. She insisted lethal predator control was the only way to protect livestock. She was misinformed. And it is important for all who value wild places to value nonlethal predator control. It works. But in Cotati and so many places beyond, coyotes present a living reminder of our overhaul of the wild, not just in rural areas, but across the U.S. Just this month, National Geographic wrote a piece about a coyote on the roof of a building in New York City, and the Natural History of the Urban Coyote notes that coyotes are survivors, living among us despite the odds. In Chicago, they walk the streets, stopping at lights to let the buzzing traffic rush by. In San Francisco, they have been rumored to cross the Golden Gate Bridge. Coyotes seem far more able to coexist than people. But coyotes should not have to survive in cities and the onus for coexistence is on us, not them. Like all wild animals, they have the right to wild places. When wild animals and humans reside in close quarters, the results can be catastrophic for the animals. Only a few months ago, a 6lb coyote pup was found, tortured, in Santa Maria. 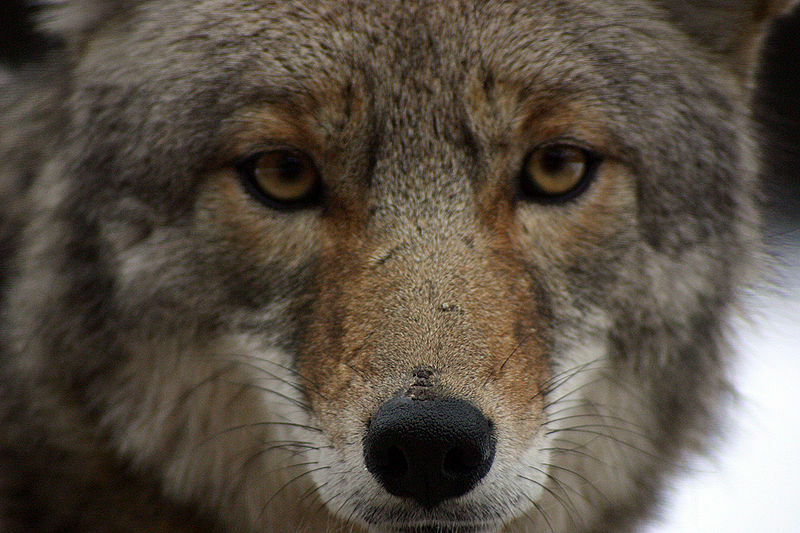 Too many people are happy to hurt coyotes, to defend livestock, their dog, their backyard, or just for sport. Coexistence is possible, as the North Bay in particular has shown, thanks to groups like Project Coyote and the Animal Legal Defense Fund. That moral right to be free of human society—(a legal right indicated by the Wilderness Act, and wilderness is an animal rights issue notes Kathleen Stachowski)—means a fundamental shift in population growth, eating and hunting habits, development, and attitude about the nonhuman world. In the last 50 years, our planet has lost nearly 50% of its wild animals. Meanwhile, the human population has exploded. What will the planet look like 50 years from now? Will there be any wild places for nonhuman animals to be autonomous? Without that, without the ability to be free of human society, without space for real solitude, whether as a human or a nonhuman animal, are any of us really free? At night, Posy and I fall asleep to the yips of these beautiful, native songdogs. We coexist like easy peas. They are there in the dark, listening to each other, as I listen to their song, and Posy listens to me. With a little care—attending to the unwritten rules of the night by respecting nocturnal creatures, keeping her by my side, letting her roam in the day–I protect her and our resident coyotes, as they protect and inherently vitalize our local lands, and I marvel in the gift of their presence, shared with mine. We coexist in a land that is rural, urban, and wild all at the same time.